I have some man made live rock from Florida,....and it is as the gentleman told me when we spoke, all covered in filter feeders. I am having a wonderful time looking very very close and seeing all the fan worms and other filter feeders on it. Some are so tiny! Like this hydroid colony. Some are bigger....and the clams are huge! It also came with 4 clams. I believe they are Turkey Wings....there are two huge ones, one middle size one and one tiny one. 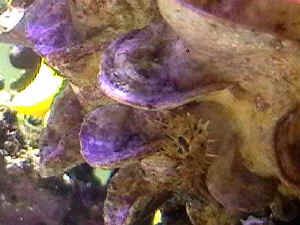 I feed Coral Frenzy coral food 2 times a week,...with the power head on and the filter off for about 1/2 an hour. 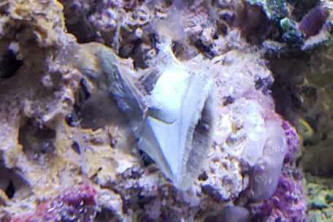 I never see any of these clams open, I see a little white tube sticking out of one of the big ones all the time and they do shift their positions sometimes. But other than that, they don't seem to ever open up. Maybe Turkey Wings don't open? I am worried that the one that fell off the rock might die and kill off my tank......how can I tell if he's dead or alive? He's very heavy, if that helps, and he's very tightly close up. I can't even see where the foot fell off! Here are pictures, let me know what you think, I don't want to take him out if he's not dead, but don't want him to die in the tank either. I just went over and reached up over the clam to check his smell, and he moved! He saw me coming! They don't even have eyes, do they?????? So, I guess he's ok. I put him up in the middle of some rock where there is a nice soft flow of water. Will he make a new foot? I don't know, I saw the part that was attached to the rock,...I sent you a picture. It's still there. But the clam was attached to that! Wasn't he? How else did he hand onto the rock? I looked bivalves up on Google and the Encyclopedia Britannica had a really good article on them,....it said that some like to live in the sand, others like the rocks and some of those that choose rocks make themselves a kind of shoe with glands on their foot....to hold on. I think what I see is what is left on the rock, It's a hollow shoe that's attached to the rock by some fibers. I tried to remove it, but it's really on there tight, and it really is just a sheath. The inside is empty. Like an empty shoe. How awesome is that! Here, I copied the important part for you. (endobyssate), where the byssus serves for anchorage and protection when formed into an enclosing nest. " https://www.britannica.com/animal/bivalve here is the link to the article. I think this article is saying that his foot secreted a fiber which they use to make a safe enclosed space for their "foot", so the foot is safe from predators and held firmly to the rock. I guess he just decided to move and that was him letting go of the shoe he made for himself. I never realized how much the Encyclopedia helped with research. It's so "Old school", but the article was great. I guess we both learned something new tonight! Have a good night and thanks for trying to help. First I would like to give you an earnest thank you from the bottom of my heart for all that you do in educating the masses. LFS's in my area followed your advice as gospel like I do. enough to lose my business forever I am afraid. My question is simple enough, but I will give you some background on my setup. calcium 450. I dose the tank with Iodine and chelated Iron for my bumper crop of Gracilaria. (Side question- when I add these supplements after a water change do I dose based on total tank volume, or based on the new water added to system? number of clams and scallops that came encrusted on liverock, 5 snails, 5 hermits, and a few different types of yet unidentified macro-algae growing on rock. My question concerns one of the larger clams that came on the liverock. and wondered if that foot was integral to the clams heath in any way, and should I be concerned that the clam is directly in the flow of the power head? Or does the clam know what is best for itself and I should leave well enough alone? I also want to explain that your site is my home page, and I often spend time reading about various species and have done so for years. Unfortunately before finding your site and Mr. Fenner's CMS and Mr. Calfo's RI I was victim to poor advice coupled with lack of research- much to the dismay and demise of previous livestock.... Enter my desire to own some sort of Gobioid creature for my underwater utopia. I swear I researched each and every specie only to purchase a *Valenciennea strigata*, and upon quarantining the fish and logging on to Wet Web Media I realized my serious error in research. I felt like someone with a Black Tipped reef shark in a 20 gallon tank with a dozen Cleaner Wrasses for food. Fast forward to me feeding him all sorts of standard aquarium fare- Mysis, pellets, and after reading that they fed on pods I bought Arcti pods- only even after watching him feed on all the above with enthusiasm he was still wasting away. I thought he was done for and went on fishbase.org and saw they also fed on nano plankton as well. My last ditch effort was mixing Mysis, Phyto-Plex, Arcti- pods, spectrum pellets, Oyster Feast, and Spirulina together and freezing it. I then chopped it into cubes and lightly covered it with sand in his favorite forage zone. He is now filling out at an incredible rate, and is a completely different fish- color wise, not hiding all the time and returns to the spot with ferociousness every time i stick the frozen goods there. I think adding the micro organisms was essential to his health and wanted to share that information- freezing was an important part as there was no other way to get oyster eggs and micro algae to settle in one place in the substrate to ensure he ingested them. Sorry for such a long winded email, but it is the first time I wrote after years of admiring.... I also wanted to ask if a 30% water change a week is too much? Thank you very much for all you do in tolerating the ignorant masses like myself who think they know everything only to find the error of their ways at the expense of a fish's life- and here's to not making those mistakes ever again! 'ciao! Flame Scallop creating electricity? - 1/19/05 Hello from the "Blue Tarp State"! <Hello from the Sunshine State!> I am totally in love with your website ... refer to it almost everyday. :o) <Great to hear, Lisa> After surviving four hurricanes, and almost a month without electricity, I am ecstatic to say that I lost NOTHING in my tank, thanks in part to you guys (and my handy generator!). 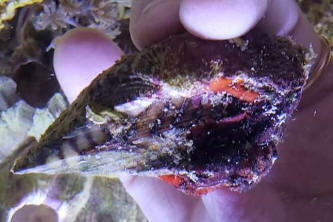 <Awesome> I have a question about my 8-month old flame scallop ... he's very content and looks healthy. <Cool. This animal tends to be on the difficult side of pet fish keeping. Here is an excellent article written by a friend of mine: http://www.advancedaquarist.com/issues/july2002/toonen.htm> I noticed the other day that part of his fleshy, red mantle "flashes" constantly. It's a very thin area, almost the width of a needle, and it changes from bright red to white in a matter of a nanosecond, and back again. <This seems to be fairly hard to explain as there is not much in writing that I could find, but I do know that in past discussions it has been stated that this is a flap of tissue (membrane) that is moved back and forth. It may actually reflect or refract a portion of light which may give it this glow or look like a quick electric arc. My feeling is that it is not electrical in any way.> Have any of you seen this reaction? <I have> If so, do you know why they do this? <Oh many possible reasons. Simple anatomical structure (just happens), food attraction ( planktonic animals are attracted to light), possible a deterrent to fish predators....these would be my guess but again, very likely just a result of respiration or a feeding.> It doesn't seem to be a problem, but I was curious as to what it means, if anything. <Not hurting the animal at all. I have seen this done in the wild by this species ~Paul> Thanks for everything! Lisa C.